Alan Yarmark combines printmaking with hand-built stoneware to create this scenic sponge holder. The spectacular Sangre de Cristo mountains from Alan Yarmark's San Luis Valley home inspire him to capture its beauty in his pottery. He combines illustration with hand-built stoneware to create this scenic sponge holder. After the first firing, Alan transfers his rendering of mountains, lakes, and evergreens to the piece, "printing" it on with a glaze. The rustic, elegant design is also wonderfully functional, catching drips so they don't land on your counter. Handmade in Villa Grove, Colorado. 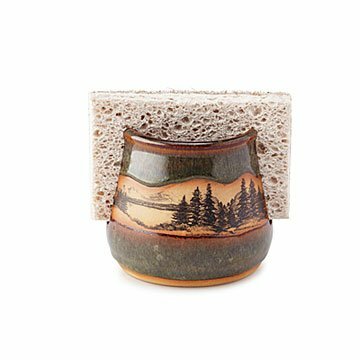 Make it a kitchen set, and pair the Stoneware Mountain Scene Sponge Holder with our Stoneware Mountain Scene Spoon Rest. I am reminded of the mountains every time I see it in my kitchen.